Indian-yoga-associationAfter years of consultation with eminent yoga experts, India’s Department of Ayurveda, Yoga and Naturopathy, Unani, Siddhi and Homeopathy (AYUSH), along with the Ministry of Health and Family Welfare, has overseen the establishment of the Indian Yoga Association (IYA), a self-regulatory body responsible for establishing standards for accrediting yoga institutions, yoga curriculums and yoga therapy. This recent development in India signals the first official government sanctioning of efforts to regulate the tradition of yoga, and it is appropriate that India, the motherland of yoga, and the Indian government, which has become increasingly aware of the need to protect and preserve its cultural heritage, should take this historical initiative and lay a much needed foundation for establishing a credible standard of yoga education and practice. Perhaps more importantly, it is also the first time that representatives from all the major lineages of yoga across India have come together in search of a common regulatory goal. This news, however, may not bode so well with yogis around the world. Many practitioners and teachers of yoga might wonder just what this means for yoga, their current status as teachers and institutions, and their various yoga practices. It may be too early to tell, but the IYA is already feeling pressure by those who feel that their approach to yoga may be compromised by any standardization. How to do this will certainly be a challenge. The word ‘yoga’ today has taken on many new and often strange associations. There is much debate, even in India, over what this ancient science is all about and what it holds in store for those who engage in it. The board members of the Indian Yoga Association must also grapple with the relevance of the age-old guru-chela (teacher-student) relationship, as well as the significance of the paramparai (yoga lineage) tradition, both of which have always been an integral part of yoga’s foundation but have become increasingly discounted by the modern approach to yoga and its teaching. So has the relevance of the very culture from which the teachings of yoga have sprung. These issues and their significance to the future of yoga are no small matters to consider. Anyone who has ever been to India knows that the wheels of Indian bureaucracy turn slowly. With much at stake, and under the direction of a group of eminent masters who have dedicated their lives to the preservation and propagation of this ancient science of life, these decisions are not likely to come easily, nor quickly. On October 31st, 2008, the IYA was officially registered as a Society under the Societies Registration Act XXI, 1860. It will be initially supported administratively and financially by the Department of Ayurveda, Yoga and Naturopathy, Unani, Siddhi and Homeopathy (AYUSH), and the Morarji Desai National Institute of Yoga (MDNIY), and will be initially based out of the MDNIY. Promotion and advancement of Yoga and its applications. Maintaining and promoting the different Indian Yoga traditions. To provide extensive research facilities for carrying out fundamental and clinical research in the discipline of Yoga and its applications keeping in view the socio-economic needs of all sections of the society. To hold Conferences, Seminars, Workshops, Camps and Public meetings to propagate information and knowledge of Yoga, its various techniques and practice in various parts of India as well as abroad. Accreditation and affiliation of Yoga Institutions including the prescribing of basic requirements for affiliation of Yoga Institutions. To conduct experiments and research on emerging trends in Yoga. To develop techniques and approaches based on the Ancient Yoga Texts and Granthas (books) of Yoga to meet the challenges of the modern era. 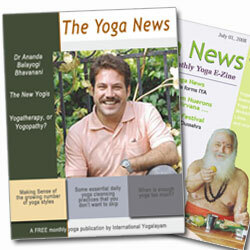 Development and dissemination of new approaches to the practice, teaching and research of Yoga. To prescribe different courses for imparting education and training in Yoga; to prescribe syllabus and curriculum for various Yoga education, therapy and training courses and programmes; also to prescribe guidelines to carry out research in Yoga and its applications at various levels. Dr I Basavaraddi also stated that the general body would be constituted soon along with the various committees such as the Academic Committee, Accreditation Committee, Research Committee, Finance Committee, Publication Committee and Public Relations and Publicity Committee.